Whether you’re going to be flying soon or your planning a zero waste road trip, it’s a great idea to reduce your waste when you travel and shoot for zero waste travel instead. It takes some planning to do zero waste traveling, but it’s so worth it! You’ll be doing something good for the environment and yourself. Not to mention, those zero waste travel essentials look pretty great on Instagram when they’re paired with a palm tree or airplane wing. Whenever you start zero waste, it takes some time to change and adapt to a different way of living. You’ll make mistakes. But once you start learning, zero waste travel can be easy, fun, and painless! You’ll be able to form habits that will become pretty much automatic as you get used to a zero waste lifestyle. 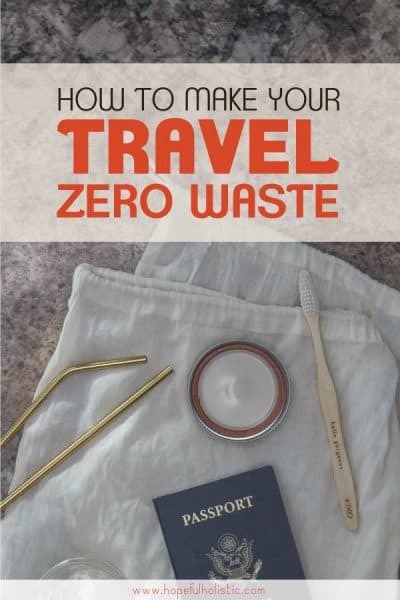 I’d love for you to learn from some of my mistakes, so here are some tips on how to create less waste when you’re traveling, as well as some of the best zero waste travel accessories for your journey! Think about the free snacks you get on an airplane. They’re all single servings, wrapped in plastic, disposable. If you’re hungry, it’s hard to say no even though it’s normally cheap and unhealthy food. And when the stewardesses collect trash, several times over a short flight, they’re left with full bags of trash that could have been completely avoided! It’s worth it to reduce waste in travel because it just takes a little bit of intentionality to make a big difference. Every piece of trash you avoid using is one less thing going into our landfills and oceans! It’s also one less demand for more disposables, single-use items to be created. Companies are beginning to listen, and they’ll create more and more change as we speak up through what we buy and throw away. Plus, the alternative options available to you are more healthy for you too, not just the earth! It’s so worth it to try and reduce waste in travel -and every other area of life- and take steps to live intentionally. It takes some planning ahead, but you won’t regret it! First, let’s take a look at my top picks for zero waste travel accessories you need to take with you next time you’re traveling! Even though a zero waste lifestyle is all about reducing, refusing, and reusing, there are still some things you’ll want to buy or acquire and bring with you so that you can reduce, refuse, and reuse. They’re especially useful when you’re traveling, since you can wash and use them over and over again, saving space and reducing trash! No matter where you’re traveling to or for how long, there are a few items you don’t want to leave the house without when you’re being intentional about reducing waste. The good news is that these items don’t take up much space, and they practically pay for themselves as you use them over time! For example, a good stainless steel water bottle lasts for years, and it will save you from buying disposable plastic water bottles that pollute the planet are wayyyy more expensive than water from a drinking fountain! Just make sure you empty out your water bottle before bringing it through airport security. 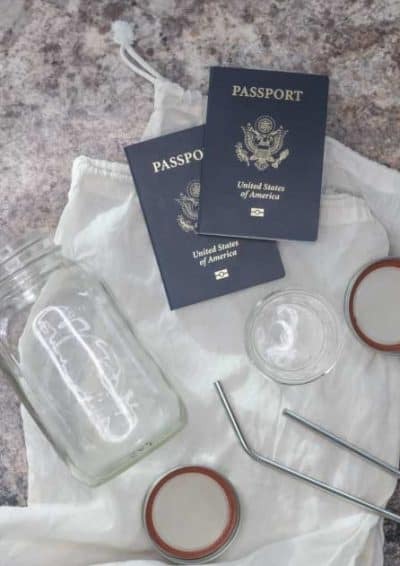 Beyond these zero waste essentials, there are a few things you might want to bring on a zero waste trip to help you to reduce plastic on your journey. This includes things like beeswax wrap, handkerchiefs, toiletries, and various travel holders. Beeswax wrap is a zero waste alternative to cling wrap that you can use for food storage. It’s a good idea to bring Bees Wrap if you’re going to have leftovers or cook for yourself while you’re traveling. Just make sure not to wash it with hot water! If you haven’t used handkerchiefs before, they can take a little while to get used to. Just remember to find one made of soft cloth, and don’t use it more than a couple times before switching it out for a new one! If you’re going to be traveling for a long time, you’ll probably want to make sure you have access to a way to wash your handkerchiefs. And for toiletries, you have a couple of options. I love my rosemary lavender shampoo bar, and I also carry a conditioner bar that all fit in the same little steel soap holder! I love not having to bring big bottles of shampoo and conditioner, and skipping travel size containers that consist mostly of disposable and unrecyclable plastic. You can also buy an awesome 3-in-1 bar of soap that works as a cleanser for your face, body, and for shaving. Don’t forget your stainless steel safety razor! There are also zero waste bamboo toothbrushes and eco-friendly toothbrush travel containers, (here’s a biodegradable kids version) but if you have a plastic toothbrush or toothbrush holder right now, don’t toss it just yet! Even though zero waste products might look cool or sustainable, try to use up what you have first. Don’t throw away what you already have until you need to. It can be tempting to get all the neat, wooden, zero waste products out there, but that could send things to the landfill sooner than necessary, which is what we’re trying to avoid! Periods have a way of surprising you (it seems like mine are only early while I’m traveling!) or you might get stuck at your destination longer than you’ve planned. Both have happened to me! It’s worth it to be prepared. Read on for some more tips on how to pack and prepare these zero waste accessories, as well as some other helpful zero waste travel tips! Besides just bringing a couple of zero waste products, here are some more handy tips to remember on your next trip! Most of these tips are things I learned by doing things wrong while traveling. I’d love for you to learn from my zero waste mistakes and do better! I’m learning and growing, and I’ll probably be adding to this list as I continue to be imperfect. One of the biggest things you can do to reduce your waste while traveling is to plan ahead by packing a zero waste kit. This kit can include things like a mason jar, utensils, cloth napkins, bamboo or stainless steel straws, and anything else you might need. Your zero waste travel kit doesn’t need to be huge or complicated, just think ahead a little bit and try to guess what you’ll use the most, and bring those things with you! If you’re going to be storing your zero waste kit in your checked baggage on a flight, you might want to opt for eco-friendly disposable plates and bamboo utensils instead of steel, since they’re lighter. Put everything in a reusable bag that you can unpack. Then just leave everything in it in your hotel room or wherever you’re staying and use for grocery shopping while you’re traveling! While traveling, I’ve found that most of my waste is food-related. Try to plan ahead to reduce waste while you’re out and about! 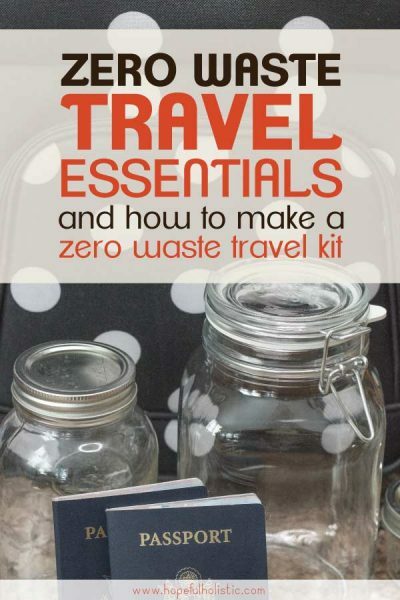 When I say plan ahead, think more specifically than just bringing along a zero waste kit. For example, lots of hotels have disposable plates and plastic utensils for breakfast. If you’re going to be staying at a hotel, it’s a good idea to bring along a plate, utensils, and a thermos. Many food places (especially fast food and airport restaurants) serve everything in disposable containers. If you bring your own glass containers, just ask them to put the food in that! I’ve found that very few places will refuse. If you’ll be eating out on your trip, bring a stainless steel box for leftovers. Styrofoam containers are notoriously toxic to our oceans and never really break down after they’re tossed. You might also want a stainless steel straw. Make sure to ask for no straw when you’re ordering drinks! If you’ll be shopping for food while you’re on your trip, check your destination to see if there’s a nearby farmers market, or a bulk or zero waste store! And if there is, make sure to bring a couple extra cotton bags or mason jars. If you aren’t flying, it can be a little easier to do zero waste traveling since you can usually pack a little extra. Whenever hubs and I travel to visit family, we always bring a crate with lots of mason jars and mesh or cotton bags for bulk shopping, since we don’t have a bulk store near where we live. If you’re going camping or on a road trip, get creative! Think ahead about what you’ll need to bring, and see if you can find a waste-free or DIY solution. One of my favorite zero waste travel essentials is my homemade hand sanitizer. It’s a lifesaver on camping trips and while traveling to places with port-a-potties! Get the super easy DIY recipe here. Make sure that you bring plenty of healthy food and snacks, since it can be hard to find zero waste food options while you’re on the road. Or just scout out sustainable places to stop along the way! If you’re traveling via airplane, it might take a little more intentionality to reduce your waste on your trip. But it’s still totally possible! One thing you’ll definitely want to bring is a stainless steel water bottle. Make sure to empty out your water bottle before you go through security! You can fill it up again once you get to the other side. And if you’re flying to a different continent, make sure that tap water is drinkable before filling your water bottle at your destination. If you’re flying on an airline that serves drinks, you could also bring your own cup so that you don’t have to use one of their disposable plastic cups. Or just bring your own drink! Bring plenty of snacks on the plane too- you can wash and reuse your containers during your trip! I always put some homemade trail mix (way cheaper than storebought) in a glass container to snack on. One last zero waste travel hack: when I’m flying, I never bring the clear plastic bag recommended by the TSA for liquids. I just put any small bottles of liquid (like my stevia) into my backpack and take it out while going through security if required. I’ve never had a problem with it! If you’re traveling, it’s easy to get caught up in your journey and forget about the good zero waste habits you’ve already formed. But waste created on a trip is just as harmful to the planet and your health as waste you create anywhere else! Just try to be flexible and remember to stick to the zero waste goals you’ve set for yourself. For example, if you’re going to be staying at an Airbnb where you know you’ll have a Keurig coffee maker, it’s easy to just make yourself a coffee using the disposable pods. This might not be the best idea because the pods are single-use and add up to create a lot of waste quickly. They can also release toxins from the plastic into your drink. And they aren’t recyclable! A much better option would be to refuse the extra trash. Either go somewhere else for your caffeine fix, or just plan ahead and bring some ground coffee and a tea strainer with you! You can steep coffee just like you can with tea, and you can get hot water from the Keurig. Or do what I do, and bring some loose leaf tea and a delicious coffee substitute with you! Overall, just be willing to make sacrifices so that you can stick to your convictions about reducing waste. It’ll be healthier for you and the planet! Even when you’re trying your best to be intentional and flexible, you’ll probably still make mistakes. There will be times when waitresses bring you a plastic straw, or ketchup in a paper cup, or you’ll forget your fork. These things happen! So be kind to yourself, and don’t beat yourself up if you aren’t completely zero waste on your trip. The thing I love about healthy living habits and a zero waste lifestyle is that they give you a healthy standard in your life so that you can take in the occasional toxin or not eat healthfully for a week without experiencing anything awful. So if you’re on a road trip and everyone decides to stop and get junk food, enjoy being with them instead of thinking about how unhealthy the food is or how you aren’t being perfectly zero waste! At the end of the day, what matters is relationships and the people you’re with, and the journey you’re on. Learn from your mistakes and move on! A zero waste lifestyle is about making small steps in the right direction, not getting it all perfectly on your first try. I hope these tips are helpful and that they make you excited about the possibilities for your next trip! I hope you enjoy your zero waste traveling. Bon voyage!